One of the main goals of any e-Commerce website is to get the highest search results. Due to this fact, merchants are always playing an SEO game to make Google, Bing and many other search engines show the “right” results on the top. In this article, we will describe a short checklist that every store owner have to perform to improve SEO. No complicated formulas or algorithms - just check and get it done. XML sitemap is a simple spreadsheet that will help you a lot while reaching the top of search results. This file will guide crawlers through the pages on your site. Some shopping carts have this tool already added to the features list, but if no, it is highly recommended to use third party extensions for this task. Once you’ve generated a sitemap, you can go ahead and add your retailer to Google and Bing Webmaster tools. This step will let search engines to crawl your site, index it and show in the results on the relevant keyword. Press on the “Fetch as Google” section. Check the needed URLs and fetch them manually. Once you see the message that the crawl is successful, press Submit to Index button. You can add your internal links and third party resources that point to your online store as well. In addition, check the errors in your robots.txt file and make sure that you’ve hidden required pages from the index. Open Google search and type site:your-site-url-address.com to see what pages will be shown to your clients. If you see less or more pages than your store contains bear in mind that you are facing the problem. Google may be not able to index all your pages or show the duplicated data. Google and other search engines usually localize the results for users. That is why right NAP will help you to get more local customers that are more likely to purchase from you. In a row with this, make sure to add your data to Google My Business to manage all the necessary information at one place. Check the relevance of the content of your site using Copyscape or Siteliner. You can also try to do this with Screaming Frog that was mentioned above. Look for all the links that point to your store and make sure they are working without errors. If some are broken, fix them as soon as possible. In addition, there are mentions without links, ask site owners to place them. Furthermore, setting up the alerts about new notices will be useful and will help you to keep an eye on the fresh updates. According to the latest statistics, the number of mobile searches has already beaten the desktop ones. In addition, Google has officially said that responsive web sites will have higher rankings than non-mobile friendly. That is another reason to use a responsive template for the online store and make sure to reduce page load time as much as possible. You can also check the video from Webmaster Team that describes the way to check your mobile site performance. All your efforts can be in vain in case you’ve chosen the wrong keyword to plan your strategy. If you are trying to get high ranks at the competitive area, try to target on the local markets for more specialised part of the audience. This will drive your sales much faster than “SEO wrestling” with bigger and more powerful competitors. CTA is a must have for almost all pages in your e-Commerce store. This will make your users more likely to do the needed action and reduce the bounce rate as well. There are a lot of methods to make customers place an order, so you are free to use all of them and choose the most effective. SERP (Search Engine Results Page) is a page which users see when they type a keyword in a search field of his browser. So, your main goal is to make your search results stand out from the other links in Google Top 10. Catch user’s attention and make them click on the link after reading a short description. That is the main purpose of SERP optimization, so make sure to add meta titles and descriptions to all indexed pages. Customers expect the website to load as fast as it is possible, and every second of waiting makes them frustrated. Your task here is to make them satisfied and provide the best experience. So, if your pages take too long to be displayed for the visitors it is only one way out - to optimize this value. Use PageSpeed Tools to analyze your store and get valuable recommendations. Make sure to analyze the amount of organic traffic in Google Analytics. The fast drop visits on your online store can be a result of a penalty or Google update. If there is a manual penalty, you can check the reason in Webmaster Tools. An algorithmic updates (like Panda or Penguin) provide notable changes in the core, so you have to stay in touch with this information. So, that is it. Try to go through all these steps, and you will see how your traffic and total sales will grow. In a row with this, pay attention to your current shopping cart SEO efficiency. In case it can’t meet your needs, you can register an account and migrate to one of 55+ most popular solutions. 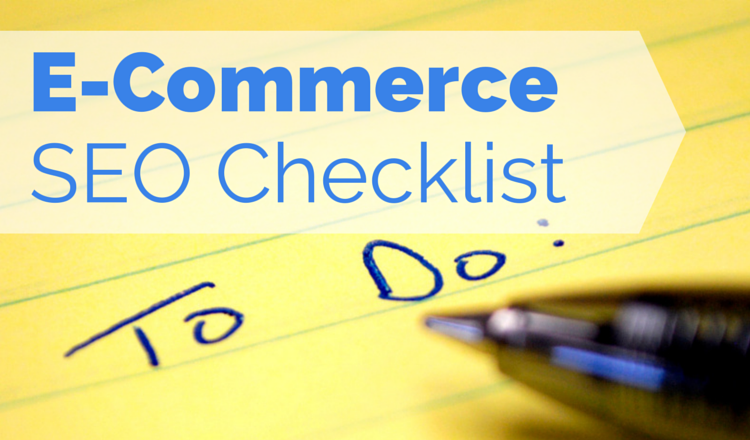 1 thoughts on "E-Commerce SEO Checklist"
Thank you, Tanya, for providing such a wonderful checklist, it was very helpful to read your article. No one can argue about the importance of a good SEO strategy for an eCommerce store. There are several SEO tools could help any e-store owner such as UberSuggest and MozBar. I have also written a piece on eCommerce SEO tools https://goo.gl/CscSR1, it might interest you. Let me know your comments on this.